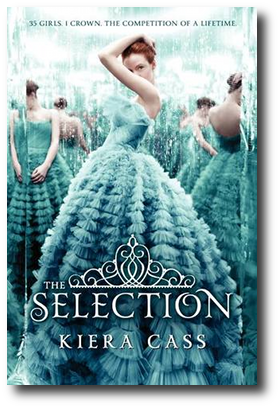 The Selection is a young adult fiction book, set in a dystopian future (of course). It is described as Cinderella meets The Bachelor. The main character is America Singer, a poor girl who lives in what was once North America. After a long and terrible war, North America became the new country known as Illea. A caste system was formed to control the people. The caste is ordered in numerical form with the ones being the richest and most powerful people to the eights, who are homeless. America is a five and as such her family is stuck as entertainers and artists. Life as a five means that America and her family are lower middle class. They are comfortable most of the time but still struggle from the lack of money. The Selection is announced on TV, calling for women from the ages of 18-20 to have the chance to marry Prince Maxon of the Illean royal family. The princes of the family marry local women to foster good relations with the citizens. The princesses marry into other royal families to make powerful alliances. Once a woman is selected as a potential bride, she gets to live in the palace and be courted by the prince. Her family is compensated for the time she spends at the palace. America’s mother urges her to sign up to be one of the selected as it would be good for their family. America has no interest in the selection as she has a secret boyfriend named Aspen. Aspen is a six which means he is of the servant class. Her family would never approve of him. Aspen wants a better life for America and encourages her to sign up. America signs up for Aspen’s sake and is surprised to get a place as a selected. America meets the other contestants who either want a fairytale romance or the power that comes from being a royal. America is not motivated by any of those reasons and simply wants to enjoy her time in luxury. She doesn’t believe she has a chance with the prince. Prince Maxon is captivated by America for her easy going nature and honesty which creates some jealously among the other ladies and confusion for America. America is confused for her growing feelings for Maxon and the ache she feels for Aspen. While the romance is going on, rebels are constantly attacking the palace. The rebels want to destroy the monarchy and end the caste system. America and the other girls’ lives are in danger too as potential royals. America is further admired by the prince for her strength during those times. I liked America Singer as the main character. I find her to be strong, down to earth and genuine without being perfect. I didn’t like her name in the beginning as it felt too much of a fake name. However, I did come to like her name after it was explained that she was named after America because she’s a strong, independent person. Prince Maxon was a surprising character in that I thought he would be more of a spoiled brat. Coincidently, America thought the same thing upon meeting him but discovered otherwise. The prince is really a gentleman and a wise leader. Aspen who is the America’s boyfriend, is a typical handsome hero who practically worships her. He is enchanted by America’s beauty and constantly in awe on how good she looks. The other girls in the selected were fine; they were not compelling at all. America does not have much interaction with others so there is not much to their personalities and backgrounds. There was also an arrogant pretty girl that America doesn’t get along with and who Maxon can’t see is mean which is typical in romance novels. It was a fun book to read and if it was a movie it would belong to the Hallmark channel or something Disney would come up with. I read the book while I was sick and it was a good distraction for me. I look forward to reading the other books in the trilogy as well as the additional novellas. It’s obvious that America and Maxon will be together because America is the main character. I thought the novel could have survived without the rebels storyline and simply been a romantic novel. The rebel storyline seemed underdeveloped but it might be further explored in the other books. It is also my guilty pleasure reads as well. I love princesses and fantasy. I bought The Elite but I haven't read it yet. I was going to buy the whole series in one go but I thought I would be sensible. I still have a long to be read pile. It seems like dystopian novels and movies have a popular following. I think the challenge is in coming up with a storyline that isn't too overused, because they all follow along on very similar themes. I think that The Selection is meant more for entertainment than social commentary. Although, the book does have social commentary in that it reflects the current love for reality tv particularly for shows like The Bachelor. This dystopian is not really saddening at all as it's not a serious book. Yep it certainly is a fun read. Perfect as a summer reading book. I hope you can squeeze it in one day on your to be read pile.